Home > Equine Court > Civil Cases > GEORGE D. PETITO, ANITA M. PETITO AND CONNECTIVE LICENSING, LLC, Plaintiffs, v. SMARTPAK EQUINE, LLC., Defendant. This is an action for patent infringement in which George D. Petito, Anita M. Petito and Connective Licensing, LLC (collectively “Plaintiffs”) make the following allegations against SmartPak Equine, LLC (“SmartPak” or “Defendant”). 3. Plaintiff Connective Licensing, LLC (“Connective”) is a California limited liability corporation with its principal place of business at 547 South Marengo Avenue, Pasadena, CA 91101. 4. On information and belief, Defendant SmartPak is a Delaware corporation, with its principal place of business at 40 Grissom Road, Suite 500, Plymouth, Massachusetts 02360. On information and belief, SmartPak may be served through its registered agent Gisholt C. Paal at 40 Grissom Road, Suite 500, Plymouth, Massachusetts 02360. 5. This action arises under the patent laws of the United States, Title 35 of the United States Code. This Court has subject matter jurisdiction under 28 U.S.C. §§ 1331 and 1338(a). 6. Venue is proper in this district under 28 U.S.C. §§ 1391(c) and 1400(b). On information and belief, Defendant resides and has transacted business in this district, and has committed and/or induced acts of patent infringement in this district. 7. Plaintiffs George D. Petito and Anita M. Petito (“the Petitos”) are the listed inventors and owners of United States Patent No. 6,645,948 (“the ‘948 Patent”) entitled “Nutritional Composition for the Treatment of Connective Tissue.” Plaintiff Connective has an exclusive license from the Petitos, which includes all rights to recover for past and future acts of infringement. The ‘948 Patent issued on November 11, 2003. A true and correct copy of the ‘948 Patent is attached as Exhibit A. 8. The Petitos own and operate The Hymed Group Corporation (See http://hymed.com/), which is a manufacturer and marketer of natural, innovative products that utilize collagen and glycosaminoglycan chemistry for the human and veterinary markets with applications in wound care, arthritis/tissue support, eye care, dental and cosmetics. 9. On information and belief, SmartPak has been and now is infringing the ‘948 Patent in this judicial district, and elsewhere in the United States. 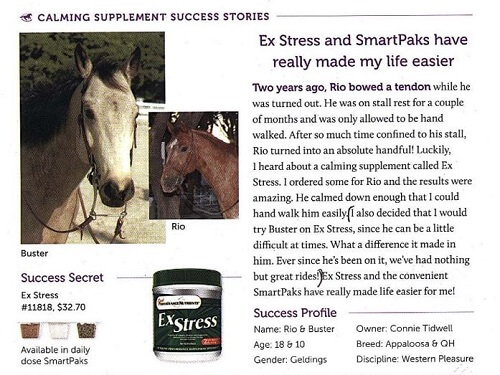 Acts of infringement by SmartPak include, without limitation, making, using, offering for sale, and/or selling within the United States, and/or importing into the United States, at least its supplement products containing a glucosamine salt, chondroitin sulfate, collagen and sodium hyaluronate. SmartPak is thus liable for infringement of the ‘948 Patent under 35 U.S.C. § 271.
http://www.smartpakequine.com/smartflex-rehab-pellets-9820p, a true and correct screenshot of which is attached as Exhibit L) (collectively “Accused Products”). 1. A nutritional composition for the treatment of connective tissue in mammals comprising: a therapeutically effective amount of a glucosamine salt, chondroitin sulfate, collagen and sodium hyaluronate. On information and belief, SmartPak’s Accused Products contain each and every component of at least Claim 1 of the ‘948 Patent. See also SmartPak’s Joint Supplement Comparison Chart, a true and correct copy of which is attached as Exhibit M, which can be found at http://www.smartpakequine.com/charts/JointCompare?t=1385242496239. 16. As a result of Defendant’s infringement of the ‘948 Patent, Plaintiff has suffered monetary damages and is entitled to a money judgment in an amount adequate to compensate for the infringement, but in no event less than a reasonable royalty for the use made of the invention by Defendant, together with interest and costs as fixed by the court, and Plaintiffs will continue to suffer damages in the future unless Defendant’s infringing activities are enjoined by this Court. from counsel informing Defendant that its products infringed the ‘948 Patent, a true and correct copy of which is attached as Exhibit N. Yet Defendant continued to make, use, offer for sale and sell its product without regard to Plaintiffs’ rights and without offering to compensate Plaintiffs for the use of its proprietary technology. 18. There is an objectively high likelihood that Defendant’s actions constituted infringement of a valid patent, and the likelihood was either known or so obvious that it should have been known by Defendant. Thus, given Defendant’s knowledge of the ’948 Patent, stemming at least from it knowledge, at least its receipt of the letter at Exhibit N, Defendant is engaging in willful infringement of the ’948 Patent, and is also liable for enhanced damages under 35 U.S.C. § 284. 19. In addition, Plaintiffs are entitled to the issuance of a permanent injunction enjoining Defendant from continuing its infringement. Plaintiffs have suffered irreparable harm as Defendant’s infringement has diluted the value of Plaintiffs’ patent rights, and has taken business away from Plaintiffs, resulting in lost profits, and a loss of market share and good will, in amounts that cannot be compensated by payment of money. Moreover, allowing Defendant to continue in its infringement would encourage other would-be infringers to attempt to gain access, resulting in significant litigation expenses and uncertainty about the value of Plaintiffs’ patent, which is the foundation of their business. In addition, a remedy in equity is warranted because, considering the balance of hardship as between Defendant and Plaintiffs, Defendant would suffer far less hardship from the issuance of an injunction than Plaintiffs would suffer if an injunction is not issued. Finally, the public interest would not be disserved by the issuance of a permanent injunction, as the public does not have any substantial interest in the Defendant’s continued unauthorized infringement. 5. Granting Plaintiffs any and all other relief to which Plaintiffs may show themselves to be entitled. Plaintiffs, under Rule 38 of the Federal Rules of Civil Procedure, request a trial by jury of any issues so triable by right. Pursuant to Federal Rule of Civil Procedure 41(a)(1)(A)(ii), plaintiffs’ claims against SmartPak are dismissed with prejudice and SmartPak’s counterclaims against plaintiffs are dismissed without prejudice, each party to bear its own costs. BPA EQUINE INVESTMENTS, L.L.C., et al vs. MICHAEL J. McCORMICK dba MTM Farm et al. 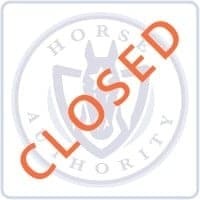 THOMAS WRIGHT and JOHN & STEPHANIE INGRAM, LLC -against- UNITED STATES EQUESTRIAN FEDERATION, INC.